The battle between online video streaming platforms in India is fierce. Netflix – one of the world’s most popular online video streaming platform has announced the second season for Sacred Games, the most popular Netflix originals in India. This battle between different video streaming platforms is not just limited to content creation. They are coming up with creative campaigns to lure the audience to their platforms. It was a no-brainer. 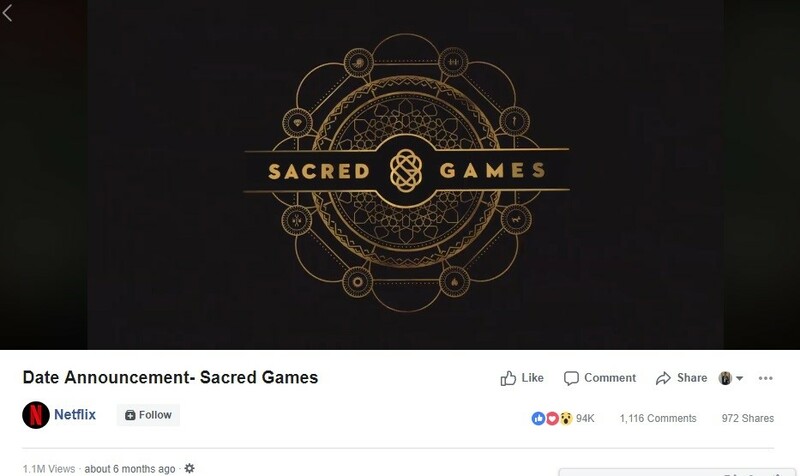 A post related to Sacred Games had to be the best in India. ‘Netflix makes a statement in India with “Sacred Games”’, wrote The Economist. Saying that Sacred Games turned out to be a game changer for Netflix will still be an understatement. 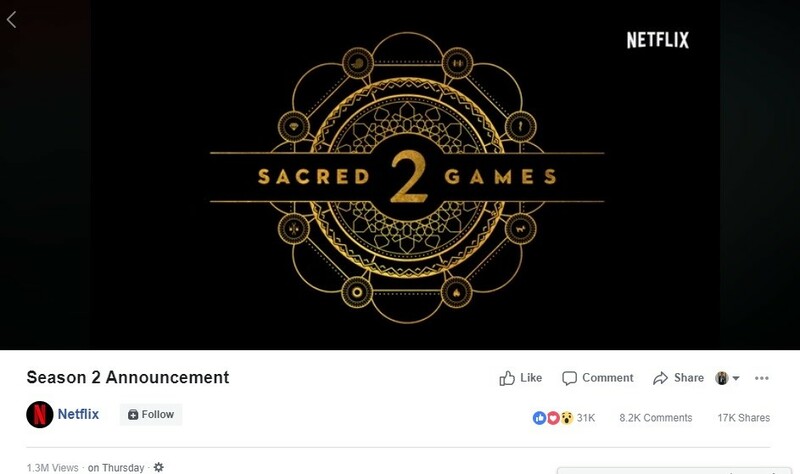 The topmost engaging content from Netflix in the last six months is a date announcement video for Sacred Games. This video garnered over 96k engagements on Facebook and 1.1 million views. Four of the top ten most engaging content was about Sacred Games–Netflix Original Series. 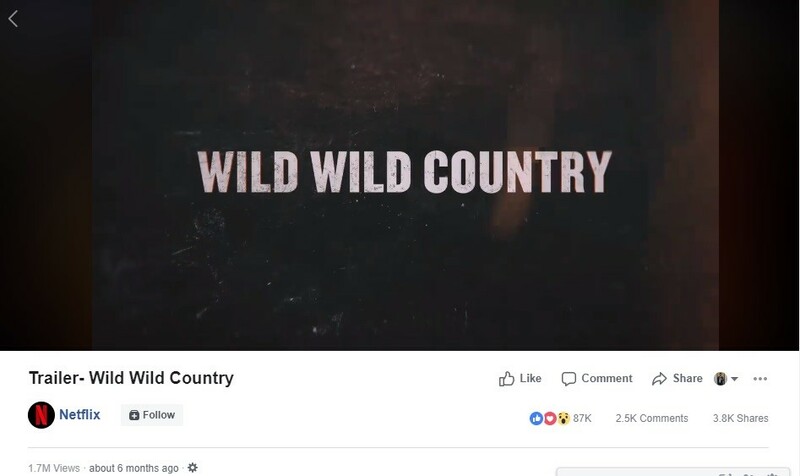 The second topmost engaging post from Netflix on Facebook was a trailer video for the Wild Wild Country, a documentary narrating the story of a controversial cult leader in Oregon desert. This video has received over 94k engagements and 1.7 million views on Facebook. Apparently, this video received more comments than the topmost engaging content. The third top most engaging content is again a video. This time it’s a horror movie trailer. 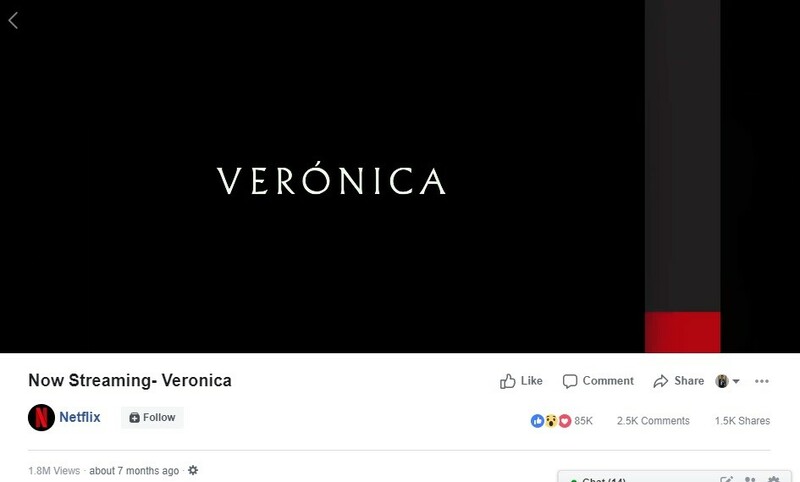 This trailer received over 89k engagements and 1.8 million views on Facebook. This is the topmost engaging video about a non-Indian content from Netflix India. Netflix is also keen on promoting non-Indian content which is also being widely accepted by Indian viewers. Six of the top ten most engaging content was videos. According to a KPMG report, the number of video-capable devices and connections are expected to grow 2.2-fold by 2021. Another reason to do more videos. Apart from Sartaj and Gaitonde, the two most popular characters of the series, the creators also introduced characters which made lasting impression–Parulkar and Shinde aka Bunty to name a few. When the audience have so many characters they like, a content like this naturally makes sense. In an image format, this turned out be the most popular image content type. It received 82k engagements on Facebook. Another think to notice here is the ‘Hindi’ copy of the post, unlike the other top four content. This six-month-old video is not at all related to Netflix India’s series or movies. This video is about the struggles student face during exam time. 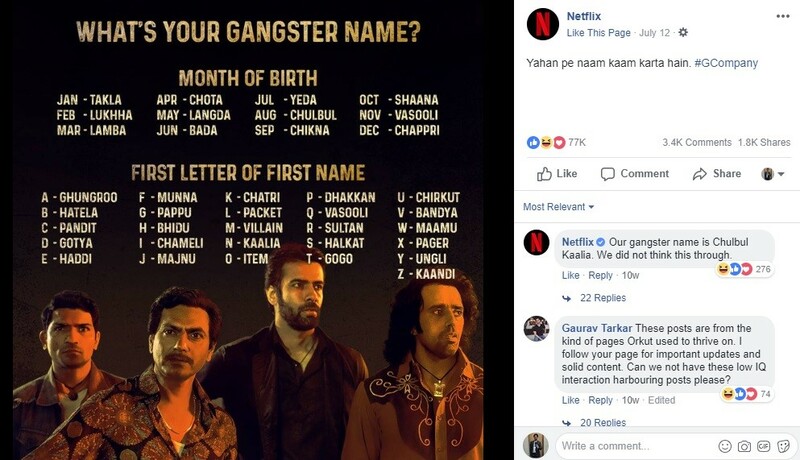 And Netflix India tried to give it a humourous touch. 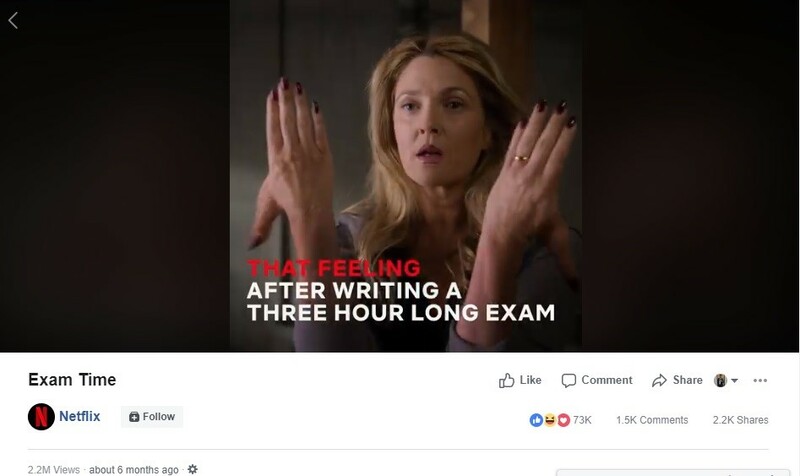 This short video received over 77k engagements and 2.2 million views–the most views on any Netflix India video on Facebook in the last six months. This photo is about a date announcement of a new season for one of the most popular Netflix Original–Narcos. This photo received over 65k engagements with over 1.5k comments and 2.2k shares on Facebook. Our first priority is getting the content right, to a point so great that people don’t mind paying for it. The character which had the least screen time, Trivedi, created the most suspense. 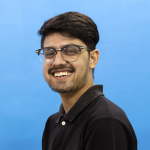 This was Netflix India’s one of the most creative social media campaigns. This photo received over 64k engagements with over 1.7k comments and 4.1k shares on Facebook. This is the only all text image from Netflix India in top 10 most engaging content. Simple and engaging. The seventh most engaging content is again a date announcement video. This time it’s from another popular show: 13 Reasons Why. This video garnered over 63k engagements and 1.6 million video views on Facebook. 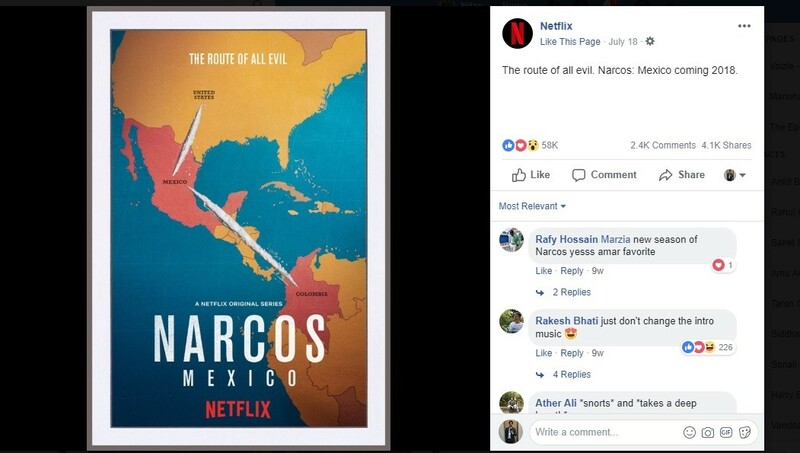 4 out of the top 10 Facebook posts of Netflix featured content related to non-Indian content specifically from Narcos: Mexico, Veronica, and 13 Reasons Why. 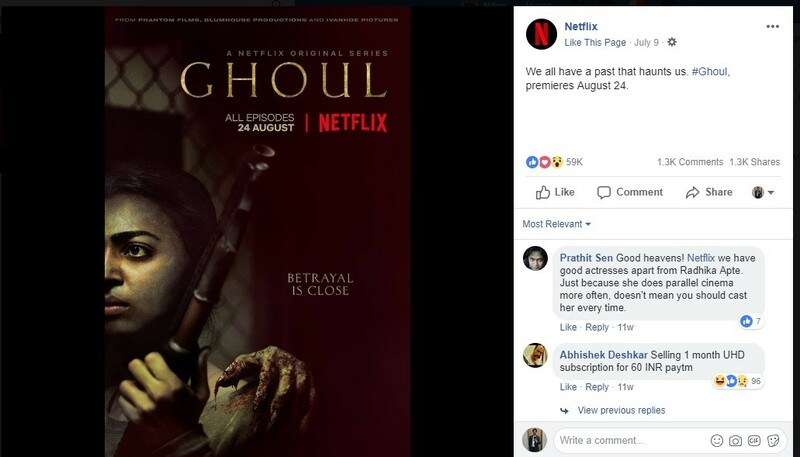 Netflix India knows how to generate engagements for their announcements. The ninth most engaging content is a poster about a new show they are going to launch in India in August. It received over 62k engagements on Facebook. We have traveled a full circle and come back to where we had started. The tenth most engaging content is again an announcement for season two of Sacred Games. 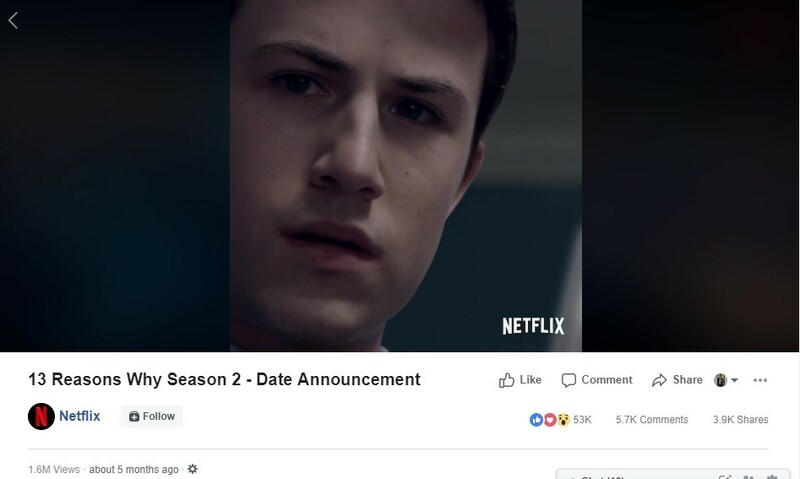 You can guess the popularity of this series in India as this announcement received over 56k engagements and 1.3 million video views on Facebook within five days. What do you like about Netflix’s social media strategy? Write down in the comments below.